What the heck is farro, you ask? It's an ancient form of hulled wheat that's low-yielding and similar to barley or wheat-berries in texture, and despite being in vogue of late, farro is actually among the oldest of agricultural products. It was first domesticated nearly 10,000 years ago in the Near East, most likely in present-day Turkey. Today it is eaten more in Itlay than anywhere else, and in the mountainous regions of The Boot there are no fewer than three closely related relict grains commonly referred to as farro: emmer, spelt, and einkorn. Apparently these hard-scrabble grains make a good crop for highlands and poor soils. My first taste of farro was at Lark restaurant in Seattle several years ago. Lark uses a local variety grown and packaged by Bluebird Grain Farms in the Methow Valley of Eastern Washington, a Shangri-La on the dry side of the Cascade Mountains known for its excellent backpacking, mountain biking, and cross-country skiing. Bluebird's farro of choice is emmer (Triticum dicoccum). They say imitation is the greatest form of flattery, which means the kitchen is a place of nearly constant praise. Most home cooks I know, myself included, spend the majority of their time either trying to perfect recipes out of a book or web site, or trying to recreate memorable meals they've enjoyed at restaurants. We leave the truly creative work to the pros and hope to capture a little of their light from time to time—such as the other night, when I finally got around to imitating John Sundstrom's creamy farro dish that I've ordered countless times at Lark. It's a simple dish. Farro is combined with sauteed wild mushrooms and a healthy dollop of mascarpone to give it the creamy unctuousness that has you coming back for more. Yet within that simplicity there is a wide range of skill required to properly cook both the grain and the fungi. I often hear would-be mycophagists complaining about their chanterelles turning slimy with cooking. This is a rookie mistake and can be solved with one easy reminder (provided the chanties aren't water-logged): never crowd chanterelles in the pan. For most recipes you want to cook the water out of the mushrooms. A good saute pan heated with a little butter or oil is up to the task—just don't try to cook too many at once. When they've expelled their water, the mushrooms can continue to brown in the pan provided there's enough surface area for the water to evaporate. This also helps concentrate their flavor. These particular chanterelles, both white and golden, came from a recent trip to the Rogue River Canyon in southwestern Oregon. Other wild mushrooms work just as well. At Lark I've had the dish with hedgehogs, yellowfoots, and black trumpets. Sometimes John adds a vegetable to it such as green beans for a dash of color and added texture. Word on the commercial street is that it was a poor chanterelle harvest this year. Maybe so, but it's also been a long harvest. Normally by Thanksgiving week Seattle would have had several hard frosts and the chanterelles—except for those in the most favorable of microclimates—would be returning to the earth. Instead they keep fruiting across much of their usual low-elevation habitat. I'm not opposed. As for the farro, I only have this one episode under my belt so I'm hardly qualified to instruct, but it would seem that one has a wide range of mouth feel to work with when cooking this whole grain, not to mention ample time. Add more water and cooking time if you prefer a softer, more yielding bite. You can also soak the grain overnight. 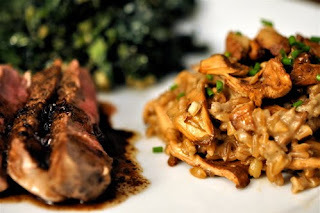 I don't know whether John uses porcini dust in his version but my feeling is that the essence of edulis improves just about any hearty dish in the dark months. 1. Reconstitute the porcini in 3 cups of warm water. Set aside for 10 minutes. 2. Pour porcini water in pot, salt the water, and bring to boil. Add farro, lower heat to simmer and cook until water is gone, about 40 minutes. Farro should be al dente yet tender. You can add more or less water and cook until desired softness. There's a lot of leeway and personal preference with farro. 3. Saute chanterelles for several minutes in butter in a large skillet, or in batches. Avoid slimy chanterelles by not crowding. You want the mushrooms to be lightly browned and firm. 4. Stir mascarpone into farro, then stir in most of chanterelles, reserving some as garnish. Season and garnish with chopped chives or parsley. We served the farro with sauteed kale from the garden and sliced Steak au Poivre. The steak was organic and grass-fed, with a single 8-ounce New York strip plenty enough to feed two of us along with the other sides. A bottle of cabernet completed the meal. Sold! This sounds amazing! Thanks for completing the menu, sounds so delicious! Sounds delish! Where did you get your farro from? I haven't looked, but I don't remember seeing it in the bulk section at Madison Market, and they seem to have a fairly good variety of 'hard to find' grains. I have been trying more wild mushrooms thanks to FOTL. Love the book, can't wait for more. Kirsten - Checked out your Chimichurri. Good stuff! Can also be made with wild chickweed in place of parsley. Thanks for stopping by. Ra - The farro is Bluebird. You can find it in bulk at the PCC, at least at the Seward branch. This looks delicious! I'm definitely going to have to try this. Niiice... 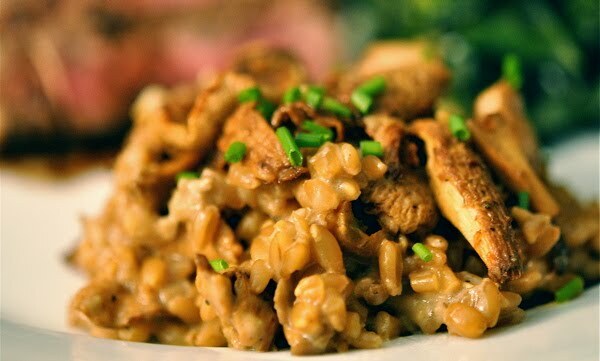 I make a version of this dish a lot -- LOVE farro! -- but never thought about using mascarpone. Good idea! I had the pleasure of the version of this dish that you brought to the Penny event, and it sure was good. Re farro, it is important to note the difference between semi-pearled and the whole grain. I much prefer the pearled - the whole grain can take *forever* to cook and sometimes never really reach tenderness. Oh, and that reminds me, I've put farro with chanterelles before too... lovely combination.